An image that does no justice to this particular costume or to the exhibition whatsoever. You’re probably thinking: “yeah but it’s like $20 to get in, and I don’t even really ‘get’ dance, least of all ballet, and textiles are dead boring, and I don’t really care about clothes unless they come from American Apparel and even then their stuff is too expensive for what it is”. But I’m here to slap you in the face and tell you to pull yourself together. None of these reasons are an excuse to miss this exhibition, and you only have two more days to see it. Alright? I’m guilty too. The show’s been open since before Christmas and I only just now decided I should perhaps see it. And yes, like you, I don’t know much about ballet, and yes, $20 is really, really painful to see leave your wallet. But. BUT. It’s been a very very long time since an exhibition of this scale (read: ‘blockbuster’) has had me completely entranced. Even humbled. A series of dark, cavernous rooms hosting glowing gatherings of costume (so many costumes!) where things glitter, colours pop and pierce the dark. All other details of the exhibition fade into insignificance. I read nothing, followed no course or directive other than letting myself be drawn towards the ghostly figures draped in the most unbelievable creations I never dreamt of. 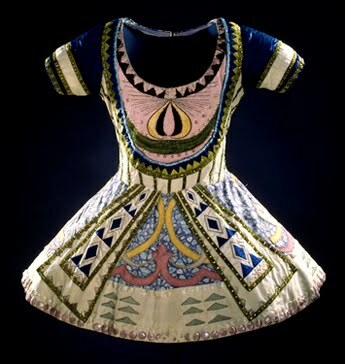 It quickly becomes apparent that the costumes and ephemera from Ballets Russes are never going to just be a collection of pretty, shiny things. A tangle of much more complex and surprisingly emotional responses followed my path throughout the show, as these masterpieces engaged with the very heart of what it is I love about art (and art is, undeniably, what they are). Everywhere is evidence of the artists’ hands – be it the designer, the costumier, the dancer and even the conservator. The huge amount of work – the cumulative hours of unadulterated creativity from each of these interwoven lives – emanates forth, vibrating from every piece. And these costumes are radical. Even now. They probably always will be. They stand for a brave new era that we will never be a part of. They are everything that is dangerous and weird and hard about art, impeccably executed and thrashing against the normal and safe and tasteful and simple and one-size-fits-all neutrals of the world so convincingly that for once, the average citizens are given no choice but to see themselves as such. Anyone who calls themselves an artist, or creative, or who works in an associated industry should see the Ballets Russes, if for no other reason that to be reminded of the meanings of dangerous, weird, hard, and beautiful, and to recollect a time when art was everything. Sunday is the last day. You have been told. Yay, I’m so glad you got to go and loved it!